Filmistan Studios occupies five acres in Goregaon, India, which is technically an outer suburb of Mumbai, but denser than most New York City neighborhoods. If you take the train from the city proper and fight the foot traffic that crowds the bazaar area around the station, you’ll reach a pair of steel gates. Just on the other side are Filmistan’s soundstages, which have been in continuous operation since 1943. In the Golden Age of Hindi Film, up to the 1960s, the industry worked along lines similar to those of the old Hollywood studio system, with each production house fielding its own stable of talent. Unlike most of its former rivals, Filmistan has remained open for business as a production facility, and the grounds now accommodate eight stages and several outdoor shooting areas, including a Hindu temple, a jailhouse exterior, and a village. But Filmistan is more than a collection of sets. Behind the scenes, there are real people living there. I came to Filmistan as an anthropologist in training, with a research project that looked solid enough, on paper, to win a Fulbright grant. One thing about ethnography they don’t teach you in school, though, is how awkward it can be getting started. Reaching out to people to do research with—soliciting “informants”—can feel like approaching strangers for a date. Left to myself in Mumbai, with my sun-glasses and clumsy Hindi, I was a field-work wallflower. I came accompanied by a camera, which during my first few days in Filmistan made me even more self-conscious. My filmmaker friend Sadia was shooting some documentary footage there, and I pretended to be attached to her crew to share her access. Once through the gates, though, I tried to leave the others behind, heading to the part of the grounds where people were living in what appeared to be a movie set designed to look like a village. I sat around, toying with my voice recorder. The women did their chores and ignored me. If I hung out long enough, away from the camera, I thought, I might earn someone’s trust. As things turned out, when I was finally able to connect with the one resident who had shown an inclination to talk, it was thanks again to Sadia and her crew. I’ll call him Vikas. He was in his early thirties at the time. He had a slender build—he’s put on a bit of weight since—and rather delicate features. Then, as now, his appearance could be rumpled. For a long time he owned only one pair of pants, and often went about in a shirt and a short lungi wrapped around his waist. But he wasn’t poor in self-regard. Once we hit it off, we’d go out for chai at a local lunch place, or the sort of stall on the roadside where the kitchen consists of a pan set over a kerosene flame. He’d insist on paying, even though we both knew he couldn’t afford it. And we’d talk in Hindi, with him doing most of the talking. What first opened him up, though, was the discovery that my English-speaking, camera-toting friends were prepared to turn their camera on him. Sadia set up her equipment and panned across the village, from the building shell that often served as a school or post office to the low-slung shelter where he slept. Then the camera returned, passing a few incurious neighbors on the way back to where Vikas stood, self-possessed, the master of his domain. It seemed to me then that he had been biding his time on the back lot all those years, waiting for his moment to arrive. The figure of Vikas’s father looms large over this history. His father had been the village leader, or headman. He had also served as a link between The Warlis and the film industry, having worked as the boom operator for Filmistan’s sound engineer, back in the Golden Age. Vikas and his mother made one of the four households that the settlement comprised, while the others were populated by descendants of his father’s sisters. Vikas didn’t hesitate to state that in the eyes of the law, responsibility for the whole village, of some twenty-odd people, devolved to him, since the office of headman came down through the male line. For proper employment, he said, he looked to the studio management, and at this point he introduced a theme that would dominate many of our subsequent conversations, what was referred to as “the case”: a legal tussle that had occurred during Vikas’s childhood, when Filmistan Studios moved to have him and his extended family evicted from their “home and place.” As he made plain, The Warlis had had their day in court and won, and because the lawsuit—and the uncertainty it generated—had prevented him from getting an education, he had a moral claim on Filmistan for support. The only thing holding him back, it seemed, was get-ting the studio to recognize that claim. In the meantime, he stayed busy consulting with lawyers or discussing with his fellow Warlis how to advance their community. Look… nowadays, we’re in Filmistan Studios. So for one thing, we understand that we’re in the modern style, so bhai, that means there are certain kinds of rules that apply to us. On account of the film industry, on account of the government, we’ve become aware of this… But as far as those people who live on the outside are concerned, they’re not perfectly aware of the rules… Those Warli people on the outside, they haven’t got a clue. Vikas and I struck up a somewhat cranky rapport. We met regularly at Filmistan and other spots nearby. We talked about the law and the old British regime and Indian politics. We talked about gods and movies. We talked about what he saw in his dreams. I’m sorry to say I often found what he told me so strange as to be downright aggravating, and there were conversations we had, some in public parks, that devolved into shouting matches. We must have put on quite a show for the retirees and young couples of Goregaon as we nattered at each other from either end of a park bench. 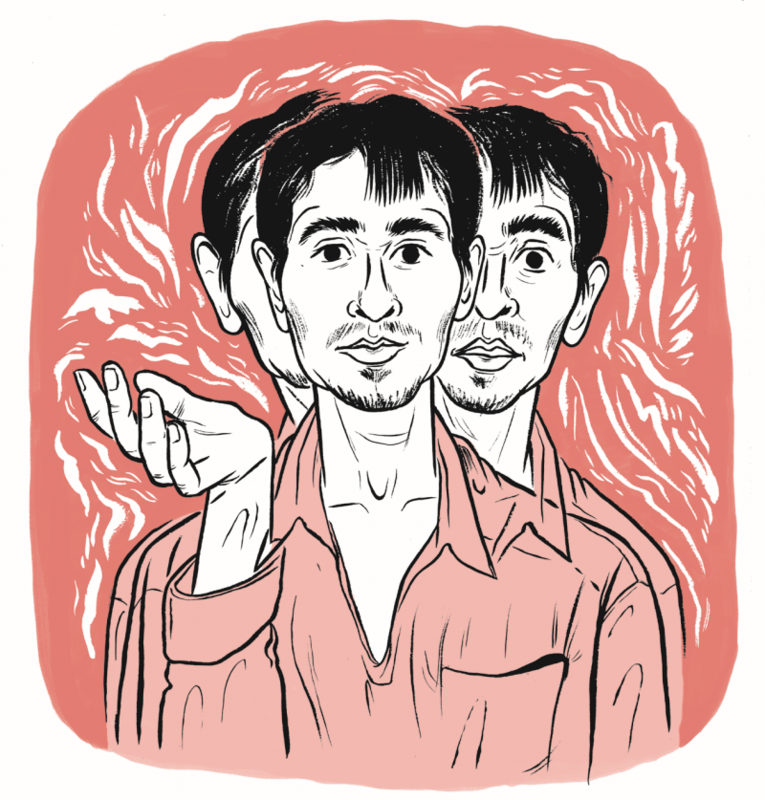 For his part, Vikas, I learned, shared information because I had stepped into his frame of reference—with my digital voice recorder and Fulbright funding—as an international man of mystery. This was probably the main thing we argued about. The more I protested, or tried to convince him that I was simply working as an ethnographer, the more I confirmed his suspicions about the nature of our work together. As I kept telling him, in spite of my apparent ability to fly here and there, my bankrolling by a global superpower, and my occasional need to report to the United States Educational Service in India—a grim-looking office downtown, entered through a gaunt-let of sandbags and heavily armed cops—I was hardly James Bond. Yet here it should be mentioned that the most extensive study of Warli culture produced to date is the work of an ethnographer who was employed, technically speaking, as a British operative. Vikas’s attitude was the opposite of that of The Warlis quoted in Save’s book. He embraced the role of informant in much the same spirit in which he had opened up to the video camera. The Warlis had rebuffed Save when he even so much as asked for their names: “Why do you want to know the name of the ‘jungli’ man?” My friend was so keen to get himself caught in the writing, he took offense when I told him that, following research protocols set up to protect people like him, I had to assign him a pseudonym. I’ve come to accept that he had, and has, the idea that my representation of his person in English text will give him visibility. To understand why, let’s consider his word secoritary, which is a mashup of secretary and security (as in guard). Vikas’s richest concepts often require Englishlike words to express them, words that play double roles. According to him, a secoritary is a paper-pusher who is also a sort of watchdog, the white-collar tiger at the threshold of those who command power in modern society, like lawyers and politicians. The secoritary checks your credentials and either recognizes you as someone who’s entitled to pass, or doesn’t. Generally speaking, for a person like me—a foreign researcher, a native English speaker—a secoritary is, at worst, an annoyance. But from Vikas’s perspective, Indian society is divided into two classes. There are people who have a certain degree of agency, and who are recognized as fellow agents by others with power, and then there’s everybody else. The most powerful, or empowered, people are the ones who appear in representational forms that circulate in public. These are the people who get their pictures in the papers or even appear on film; that’s how they get recognized in the first place. By the same token, the less powerful you are, the less visible you are. At the margins of society, your visual record may not even extend to forms of government ID, and this can leave you in an acutely vulnerable position—you’re an undocumented alien in your own land. As for your physical body, the secoritary will find a way to look right through it. In this sense, there’s no one in India less visible than tribal groups like The Warlis. Labeled through the centuries as “jungle people,” adivasi communities have historically been consigned to wilderness regions beyond the rule of law. And this is where Vikas’s insight about “modern rules” lands hard. Forest-dwelling Warlis—the descendants of those who were so mistrustful of Save’s pen and paper—can be said to be not only unlettered but illegible. When he claims his own spot in the modern order, Vikas draws the line between himself and them. But it’s not enough simply to assert your awareness of your citizenship; you have to demonstrate it. And to demonstrate it, you have to acquire a recognizable form. When I first met Vikas, I made efforts to connect him with social workers who could help him gain access to legal resources, but he made it clear this was doing him no favors. Vikas, I would learn, lives in a world of layered realities, and these layers become visible through different filters. The reality of the law, and of the modern world that is organized by it, is filtered through the English language. What it looks like is lines of Roman type. It’s as though all the mod-ern, upwardly mobile Indians the law empowers were walking around Mumbai wearing Google glasses, and when they look at him he doesn’t scan. Vikas wants his hypertext. In getting to know Vikas, I wish I could say I came to see Filmistan through his eyes. But his was not a vision that could be seen all at once. A better way to put it is that, in the course of our conversations, a layered geography took shape. Some of the geography was visible, but other coordinates were tied to memory. To learn its coordinates, visible and invisible, was to get a sense of the village, to understand its realness. There was, for example, the village well. It had long run dry, but the cement rim was still favored by The Warlis as a spot for hanging out. There were the two other wells, known to conduct running water even though stages three and four had been built on top of them. Some in the industry said the construction of the stages over the wellspring had angered its resident water spirit, and blamed the decline in Filmistan’s business fortunes on the curse it had cast. And this was not the only haunting. On stage four there was said to be the ghost of a German technician who had fallen from the rafters years ago, far from home. There were also the trees of the village, living and deceased. Mango and tamarind trees, Vikas told me, had once marked the approach to the village, and a banyan had given shade to one of the temples. Some of these trees had been sacred hosts to spirits that dwelled inside them. They had all been cut down, of course, to make more room for production crews who needed to set up and take down sets. And then there were the two temples: the small shrine to Wagh, the tiger god, who guards the village bound-ary, and the larger temple, which had belonged to Wagh’s boss, the gaondevi, the goddess who personifies the Warli village as a whole. To my knowledge, filmmakers have never made any alterations to the tiger shrine, although I’m sure they screen it off when it gets in the way of their shoots. When I asked the Filmistan management about the gaondevi temple, however, I was told the studio had beautified a site that had formerly been crude-looking and ugly, hardly legible as a temple at all. Vikas’s characterization of the old temple was similar. He described it as “just some rocks.” The new icon was a painted statuette, showing Datta, a regional deity especially popular among Brahmins. What had happened at the temple was a sort of gentrification, impelled by a neoliberal logic highly concerned with surface appearances. Bulldoze the slums and put up shiny new buildings; once Mumbai achieves the look of modernity, investment money will arrive to redeem it. As it happened, Datta didn’t have much of a draw. For most Hindu workers at Filmistan, the temple’s use as a set had negated its status as a real temple. But what about The Warlis? Did they miss the old rocks? Vikas was actually the only Warli I ever saw praying at the new temple, and a village goddess who commands an audience of one can’t exactly be said to be watching over a thriving community. As for just what, or whom, Vikas was seeing when he looked at the Datta statue . . . that was a complex question. How did he experience his connection with the goddess, and with the other, all-but-invisible contours of the village behind Filmistan’s surface? The pieces came together only once I recalled what he had told me during one of our very first encounters, when, recording gad-get in hand, I had approached him at the tiger shrine. I had been baffled, because the term makes no sense in terms of caste: adivasi and Brahmin are mutually exclusive categories of identity. But “I am a tribal priest” is a different kind of statement. This is more like a double role. Historically, The Warlis worshiped their own gods without looking to Brahmins to perform their rituals for them. Among themselves they recognized certain individuals as qualified to mediate with the tribal gods on behalf of the community. One of the qualifications was family lineage. Vikas had told me that the office of headman had been passed down from his father; he was, therefore, the political leader of the village. He had also told me that, by the same logic of inheritance, he was the spiritual leader of the village. There are some standard features of Warli religious observance that can strike mainstream Hindus as backward or sketchy. These include animal sacrifice, alcohol consumption, and, above all, spirit possession. I had known for some time that Vikas was prone to seeing visions; or, to put it in terms more sympathetic to his own take on things, aspects of the world that were normally invisible sometimes revealed them-selves to him. But he was also subject to possession. On occasion, spirit-beings to whom he had made himself open would take control of his body and use it as a platform from which to address other people, to call them out. To me, though, what seemed most important about Vikas’s possession experiences was not their verbal but their visual dimension. Possession was the flip side of his visions, of his ability to see the hidden presences that made the village the village. I saw a parallel here with movie-making. A spirit medium is a someone who gives spirits form, who makes the invisible visible to others. And the ecstatic performance of possession has the power to move an audience. By the same token, it can flop. As the cooler weather approached, and with it the Hindu wedding season, the villagers prepared for the marriage of Vikas’s cousin Bhushan. It was going to be celebrated Warli-style, with the traditional fixings: drinking, dancing, meat, and worship. It came as a surprise to learn that Vikas, the self-appointed medium, viewed the impending ceremony with dread. These ritual activities made Vikas susceptible to fits, he explained, and his fits had, in the past, incurred beatings at the hands of Bhushan and other relatives. The beatings, in turn, made him more vulnerable to fits. And there was further cause for alarm. This wedding, in particular, was fraught with suspense, he told me, using the English word. Ever since they had lost “the case,” the Filmistan managers and their hirelings had targeted Vikas with black magic. A by-the-book wedding was hazard enough, given the drumming that would summon the village deities, and his own sad history of spiraling into booze-fueled abandon. But Vikas was additionally concerned that Bhushan or one of his other persecutors might seize the occasion to call on a shaitan, or “Satan,” to visit his body. To my mind, the real threat Vikas’s relatives posed wasn’t witchcraft but indifference to him. Bhushan and others of his generation represented themselves to me not as tribal but simply as poor, no different from the legions of other poor people in Mumbai. I don’t think they really wanted to see the Warli village anymore, and they didn’t want Vikas to try to show it to them. They didn’t have much patience for his legal scheming either—they put their efforts into the daily work of getting by. I refrained from telling Vikas that I doubted that Bhushan and the rest had the power to send him a demon. But I did ask how he thought they would do it. He was happy to explain. Shaitans, like ghosts, are known to circulate in the air, and one of the rea-sons they are dangerous is that they have no fixed domicile. They drift around in search of a place to settle, like the receptive body of a medium in a trance. They need a home because one of the things that makes local gods gods is that they have legitimate local addresses: they occupy sacred rocks or idols or trees, like the former mango and tamarind trees of the village. At the time of a possession ritual, someone with the right kind of insider knowledge can signal the shaitans lurking in the neighborhood and sic them on the medium. And of course this invisible ecology has implications for the establishment and care of village temples. For example, if you set up a temple at the wrong coordinates, it can endanger the whole area by offering a roost for a shaitan. So can a correctly stationed shrine if you make a mistake in how you address your prayers: the demon can intercept the transmission. This scenario works “like a short circuit,” Vikas said, drawing me a diagram of two terminals connected by a wire. A nimble-fingered shaitan can connect to an exposed line like a shanty-town electrician. Some library research confirmed that this explanation was in step with traditional Warli beliefs about spirits, as recorded through the ages. 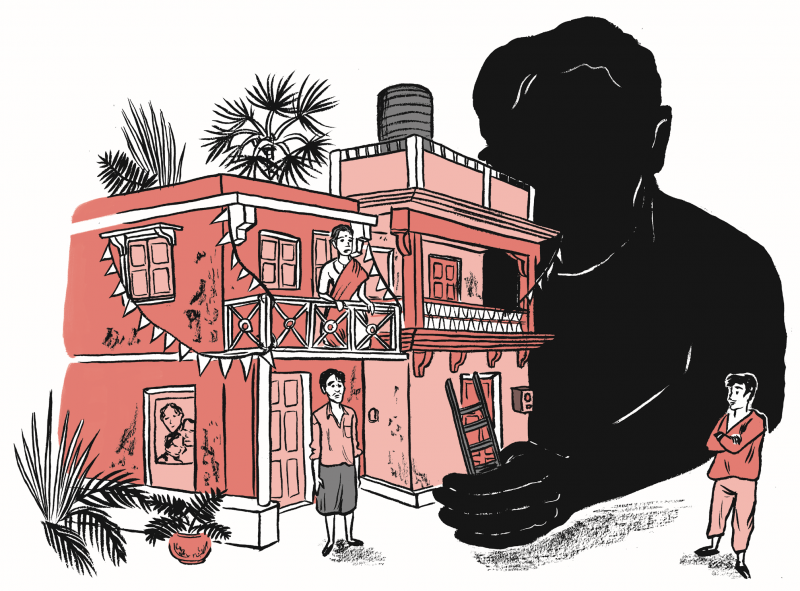 But I also couldn’t help but read into it some of what I was picking up about the anxieties that surround housing in Mumbai, among poor and rich alike. There’s something so bleakly modern about the fate of those wandering spirits, kept resentful and desperate on the hunt for a legible address. Lack of recognition turns a citizen into a squatter, a deity into a demon. In the end, I didn’t go to the wed-ding. It wasn’t really Vikas’s place to invite me, and I didn’t want to embarrass him or heighten family tensions with Bhushan or anybody else. I would have been a wallflower anyway, I told myself. He didn’t mean that science had explained the gods away. It was a question not of faith but of method. People still took the presence of gods for granted, but modern technology was making the old ways of experiencing it—possession, sacrifice, prayer—obsolete. The funny thing was, the whole system of Warli religion as he laid it out—with the invisible energies that traveled through the air, the temples that grounded them at local points, the use of his own body as a receiver/transmitter—already seemed to me like some field of crypto-science. Back in his grandfather’s time, it had been clear that the village was a real village, the home of a community of Warli people and their gods. On ritual occasions, the gods took shape before their human subjects, and in this way they revealed that the local network that connected gods and people (and trees, wells, and spirits) within the space was “live.” This old system was “religion,” or dharma. In his father’s time, a new system had come to redefine the village. It replaced the sovereignty of gods with the rule of property, and spirit mediumship with English paperwork. That was the law. And by the time Vikas was a child, another system introduced back in British days was scrambling relations among gods, spirits, and different classes of people all over again. It did so by altering the way they appeared to each other—reassigning who saw, who was seen, who showed what and how. This third filter of reality was another word of his invention: mujictions. The word was a mashup of music, magic, and motion (as in motion picture). What we see in the theater is mujictions in action: heroes and heroines, and, of course, villains, projecting their glamor in scripted roles. You laugh and fight along with the hero, and in India you sing with him too. One day Vikas told me he had enjoyed a talk with my documentarian friend Sadia. I was surprised, because Sadia had flown back to America a while ago. I asked how they had communicated with each other, and he showed me an English-language newspaper he had found with a picture he said was of Sadia. I told him the woman in the photo wasn’t her. I was getting annoyed with him, although now, looking back, I can’t say exactly why. I also don’t remember if my point—that somewhere in Mumbai, recently, a photographer had clicked the shutter to make a photo-graph that got reproduced in a newspaper, and that my friend had been nowhere in the neighborhood of any of that going on—rattled his sense that she had spoken to him. I did know he was an obsessive reader of the Hindi papers. In fact, one of the first things I had learned about him was that he read the news-paper every evening. Way back at the time of Sadia’s video, we had asked him about this eccentric approach to keeping up with current events. Many people tell me: “I don’t get why you wait till night to read the newspaper.” And what I’ve said is: “Look, bhai, I’m no James Bond. I’m one Indian citizen. I’m not going to be able to fly in like James Bond to wherever… and save anyone.” The only thing I can do is try and say: “Bhai, what’s going on over there shouldn’t be happening…” That’s what I can say as a citizen. But to go flying already the way James Bond does, to just take off and get somewhere the way James Bond does, to take off and get there the way Superman does, and stop it—I can’t do that. I’m a human being, not some kind of angel… I’ve got no wings. I had thought about this statement many times. But it hadn’t occurred to me that this newspaper-reading habit of his was another way he expressed his desire to be recognized. In his nocturnal monitoring of newsmaker figures, he was actually reaching out to them through their pictures; this was a private ritual, one that held the potential for a two-way exchange in which he stood witness to his life conditions before the likes of James Bond, someone who might have the power to do something about them. But why had he reached out to Sadia, of all people? She wasn’t a movie character, or even a movie star. Then again, she was a film-maker; she had captured his image on her camera, and I think in that act, for him, she had demonstrated her mastery of mujictions. She belonged to the class of extraordinary people who commanded spirit through technology. Like James Bond, or Superman, or perhaps like an angel or devil, she flew about through the air from one portal to another. These portals were set by images. Until the end of my Fulbright year, Vikas must have had hopes of unearth-ing my undercover double role. In due time, my Mumbai mission came to a close. I compiled my receipts. I packed up my fieldnotes, my records of what ordinary Indian citizens had told me about what should and shouldn’t be happening. I put on my sunglasses and holstered my pocket recorder, and I, too, flew away. That was not quite fifteen years ago. Our friendship endures. Against my expectations, Filmistan—both the studio and the village—have flourished over the years. The number of Warlis making their home on the grounds has doubled, to fifty or so. Vikas writes me long, discursive letters in Hindi, which I confess that I find, between his spelling and his penmanship, difficult to read. His health hasn’t been good. The last time I saw him, two and a half years ago, we went to get tea and catch up. A local businessman had been giving him a lot of support in managing his illness. This benefactor also introduced him to the teachings of a guru who has developed a new meditation technique, and Vikas has become very keen on this. It’s practiced in front of a computer screen. We walked to a neighborhood storefront and he brought me around to the rear, where a door opened on a cramped space—like a phone booth, in my memory—almost completely occupied by a young man with a desktop PC. A fellow devotee of the technique, he invited us to take turns at the monitor. Vikas had also developed an attachment to Jesus and we agreed to meet the next day at a Catholic church. He wasn’t considering conversion; it was the particular images viewable at that church that he was interested in. They held potential as portals. As do many other ecumenically minded Indian people, he has a version of Jesus Christ that involves a double role: Yeshu Krishna. We experimented together with one of the few presents he has ever accepted from me, a digital spy camera, and he copied some of the video he had been shooting onto a thumb drive for me to bring back to the States. He also passed on a thick stack of papers that were covered in his chicken-scratch. Lufthansa shrink-wrapped it all into a solid block that was almost as high as it was wide. Then they charged me a hundred dollars for extra baggage. It’s all research material, of course, or so I told the office when I filed for reimbursement. I haven’t unpacked it all yet, but I believe it contains more than one screenplay. William Nakabayashi is a pseudonym. The author’s work with “Vikas” is described in more detail in a book coming out in fall 2018 from the University of Chicago Press, The Neighborhood of Gods.